PAW can be a physical workstation or a virtual machine (VM). Using a VM may weaken the overall security of the PAW and the enterprise architecture behind it, since the virtualization hypervisor is the security boundary, not the PAW itself. Additional security features are also required - the PAW must be a Shielded VM or similar, due to the fact that hypervisor administrators have the ability to access the PAW (and/or its storage files) through the hypervisor console or by access the datastore. So, you’ve decided that you want to deploy PAW in your environment, but how does this theoretical concept convert into an actual physical machine? Several things need to be present before your PAW journey can be initiated. A physical workstation with Windows 10 Enterprise – Download the latest Windows 10 Enterprise (currently version 1809) from Microsoft and verify the checksum. Make sure the ISO has not been tampered with. A secure windows configuration – I recommend implementing Microsoft’s Security Baseline and Sean Metcalf’s guide to developing a secure baseline. This (1809 in my case) baseline by itself does not guarantee complete lock-down, but it is a great start for a the PAW configuration baseline. Active Directory Users, Groups and OU’s. Additionally, the workstation used for PAW should support Virtualization, Secure boot, TPM 1.2/2.0, 64-bit CPU and UEFI. Install Windows 10 Enterprise on the machine. Remember to use a strong password for the built-in user. Once installed, update the Operating System to the latest patch releases via Windows Update servers and not an internal WSUS. Do not join the PAW to the domain at this point. Create a Central Store with the latest (1809 in my case) ADMX templates on your Domain Controller. Download the Microsoft (1809 in my case) security baseline and import the GPO’s to Group Policy Management Console. Download the Firewall profile from https://gallery.technet.microsoft.com/Privileged-Access-3d072563. Create a GPO “PAW – Windows Defender Firewall” and import the firewall settings. Create a new AD user, only to be used for the PAW, with a strong, 24 character or more password. Create Domain Local security group “PAW-Users” and add the newly created user account to this group. 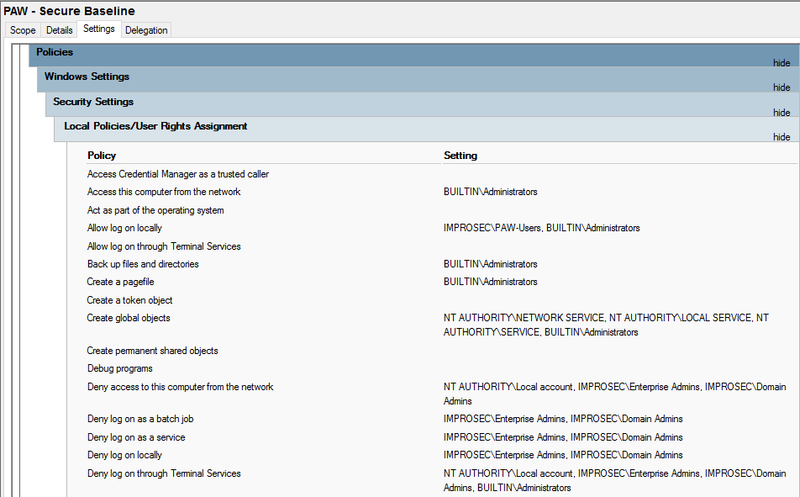 Create a separate OU just for PAW and link the imported GPOs to it in the Group Policy Management console. We’re now ready to install the required tools to perform the administrative tasks. For this we’re going to need Remote Server Administration Tools (RSAT). The needed tools for administration should now be installed, and we’re ready to create a Windows Defender Application Control (WDAC) policy. WDAC is used for Application Whitelisting/Control and since this PAW is designed for one specific task, administration of Active Directory, we want to make sure that no unwanted applications are allowed to run. Unlike other solutions such as AppLocker, when the WDAC policy is signed, an administrator cannot disable it. WDAC is hardware integrated to ensure that even users whom successfully escalate to NT\SYSTEM won’t be able to disable the policy. Another benefit is that WDAC will ensure that PowerShell is limited to Constrained Language mode, which limits its functionality on the local machine to few core functions, which are enough for the purpose of the machine. Proceeding with the implementation, save the recommended block rules from Microsoft to ‘.\BlockRules.xml’ and create a WDAC signing certificate. Select the Update action, and select "Administrators"
You’re now ready to RDP to your desired Tier 0 system, using your Tier 0 account, with the required privileges. As a final note, do not assign the user “paw.nfp” user any privileges locally on the machine or in Active Directory. LAPS should be deployed to PAW machines and the local built-in Administrator account should be configured with the LAPS installation. For the above configuration, I recommend using strictly RDP to connect to Tier 0 systems and manage them directly. RSAT is installed, however the permissions set in the GPO’s will not allow any privileged users to login nor run these tools locally on the PAW. Edit the GPO “PAW – Secure baseline” before attempting to use RSAT tools. Remember that the above PAW solution is not a final product. This is only the initial configuration of PAW.